When I was a kid, those days there weren’t smartphones or tablets, but the TV was the only electronic device as a source of entertainment. Back then televisions were small, and a regular dresser was enough as a TV stand. These days there are LCD, LED and Plasma TVs which require a strong TV stand if you don’t want to mount your TV to the wall. I may not know the reason, but I have been fascinated with different TV stands. I have searched many TV stands online, and if you are like me, you may find one of the best tv stands from this definitive guide. This guide is about TV stand materials, styles, its types, brands, DIYs and much more. It may sound strange to you, but bamboo is more durable than oak according to HomeAdvisor. Some rustic furniture made of bamboo from the early 60s to 70s can still be found in good condition. And it makes it the most durable form of furniture. The only downside is, it is not that widely used these days, so it isn’t easy to find a good variety of bamboo TV stands these days. As compared to many other hardwoods; birch is the affordable one while it can take stain easily. For a birch TV stand, you would, of course, have to keep it well maintained. However, it is still durable wood and good looking too. It has many species such as Silver Birch, River Birch, Himalayan Birch while the two popular species are yellow birch and sweet birch. 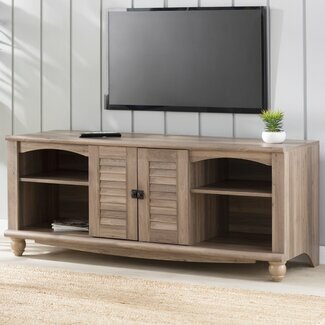 As compared to bamboo, you can find a great variety in birch TV stands. Cedar is considered a softwood yet it has about 30 years of lifespan even when not well maintained. There are still some cedar TV stands available, but it isn’t much common in this area. While if you go with cedar, its great type is red cedar. Mahogany wood is one of the very traditional materials used for making some great furniture around the world. It is the rare piece of wood which is very durable when it comes to furniture. It is also used in flooring in different types of houses. Because of its durability, a TV stand made with mahogany wood can be expensive. But if you care about having a solid TV stand, it is entirely worth it. Oak has been favorite wood for making modern and mid-century modern furniture. If you are using one of those styles in furniture, the chances are you might be using oak furniture. Being a durable hardwood, it is also abundant in the USA. Its most popular types are red oak and white oak. However, the white oak is more durable, but the grain texture of both kinds is the same. Likewise, having a TV stand with oak, would give you a long lasting TV stand. Usually, you will find pine wood in rustic furniture. It is usually an in-expensive solution for different types of chairs and kids’ furniture. The TV stand made of pine wood would need extra care. OK, after reading this, you might wonder, seriously! Mango wood? Well, it might not have been the most common wood for furniture, but it is a very durable form of timber which can give long years of strength to your TV stand. This hardwood has dense grains, which make it strong enough for heavy tables and chairs. Because of its durability and increased availability, it is an affordable alternative for maple and oak wood. I have been looking through and found it has a good variety for TV stands. Teak is one of the most durable wood. However, the furniture made with it is often expensive. This hardwood type is generally used for patio and other outdoor furniture because it can withstand summer, winter and different environmental changes making it even more desirable. Because of its this kind of durability when it comes to indoor furniture such as a TV stand, it remains stable for a very long time. It is another wood for making beautiful furniture. The walnut wood is a durable hardwood which has two common types: English Walnut and Black Walnut. The furniture made with this wood isn’t that expensive, but it can be if the solid walnut wood is used. A TV stand made of walnut wood would not only be durable, but it would also have a beautiful color. It is another one of the hardwoods which are generally used for making kitchen cabinets or dressers. The best thing about it you would like is, it is not only very durable, but it is affordable too. 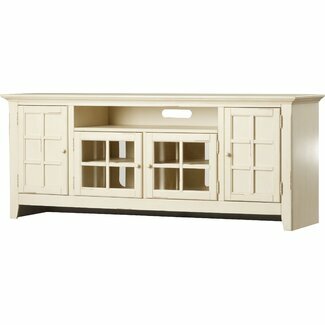 Its creamy texture can give you a clean light-colored TV stand if it is not painted or finished. I mean an unfinished wooden TV stand. As we know, steel is one of the durable forms of metals. It is stainless and gives excellent life to furniture. Usually, steel is seen in conjunction with other materials, for example, a furniture item can be steel and glass, steel and wood or can also be only steel. A steel TV stand would have its look, while if your room has glass doors or glass top furniture; it would look more attractive when mixed with those items. When it comes to iron furniture, wrought iron has been widely popular because of many features such as easy to weld compared to cast iron. It is lightweight too. It is a durable form of iron which can bend but wouldn’t break easily. Mostly in TV stands, wrought iron is not used alone. It looks more beautiful when used with wooden pieces or planks, giving your TV stand a classic look, yet keeping it highly durable. OK, now it might sound weird to you but it is also a form of TV stand. Truss is generally used in huge projects such as for bridge roofs or biggest frameworks. While, because of such kind of durable truss construction various manufacturers have built truss TV stands. Why don’t you surprise your guests by having such a TV stand? Look, it doesn’t matter how weird it looks, but it is still a unique piece of furniture item which looks good. Usually these can support for up to 60 inch TVs. Some truss TV stands can be used for attaching more than one TV. Give your flat panel TV set the best host from this stunning collection of contemporary TV stands. These TV stands feature stylish and trendy designs to enjoy the view even when your TV is turned off. This TV stand gives ample storage space to accommodate all your media gadgets, and this TV stand collection has a wide variety to pick. The Sunbury Electric Fireplace is sure to become a stylish and highly useful addition to your living room. With its four exterior shelves, this TV stand provides plentiful space for keeping all your media players like music system, DVD player and gaming console. 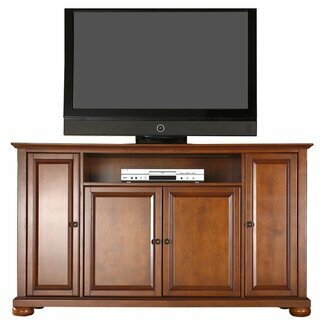 The large and sturdy top easily accommodates flat screen TV sets of up to 60 inches. Its ventilation feature allows sufficient air flow to the cabinet. There are holes in the rear panel for cable management that would enable all wires and cords to be neatly organized. 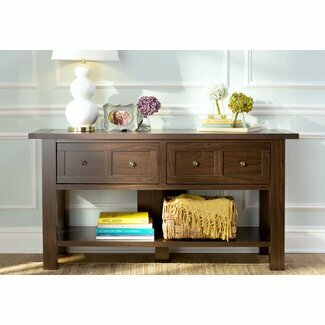 Constructed from MDF wood, this lovely TV stand has a gorgeous espresso finish that complements almost all types of room décor. Treat your home with this gorgeous slim and sleek Ashurst 39.25 TV Stand. It features gunmetal gray finished metal frame with Sonoma oak wood grain finished top. It has spacious top that can conveniently accommodate any flat screen TV of up to 42 inches wide. The Emmett TV Stand comes with two open shelves that provide ample space for storing your media devices. This stylish and compact TV stand is versatile and can also be used as an elegant coffee table. Length: 17“ – Width: 40“ – Height: 18“ – Weight: 21.56 lbs. Enjoy watching TV in style with the chic and stylish Anna TV Stand from the house of Zipcode™ Design. 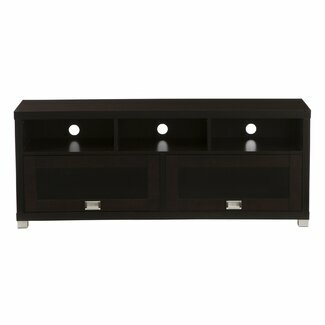 This TV stand has a beautiful dark brown finish which works perfectly well with almost all color themes and room decors. It offers plenty of space to accommodate up to 58-inch wide flat screen TV along comfortably. Three open shelves along with two roomy drawers have ample space for keeping all your media players and other components. With cable management features, this TV stand is the ideal choice for those who love to keep their home well organized. Length: 15.625“ – Width: 57.625“ – Height: 23.375“ – Weight: 6 lbs. Featuring elegant contemporary styling with a rustic touch, the Rorie 59 TV Stand flaunts an appealing look. The dark grey weathered finish complements its graceful profile. The square lines, floating top effect and chunky legs enhance its excellent design. With one full open shelf below the top and two drawers along the bottom, this functional TV stand offers ample space for all your media players and other appliances. Length: 15.5“ – Width: 59“ – Height: 19.75“ – Weight: 8 lbs. Showcase your great aesthetic taste with the retro-style Casady 42 TV Stand. 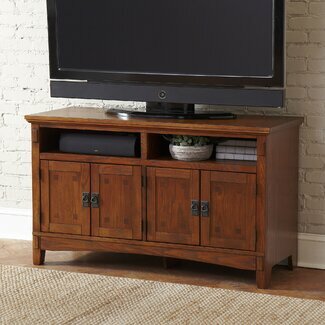 Featuring sturdy MDF construction, this attractive TV stand is adorned with light Sonoma oak wood grain finish. 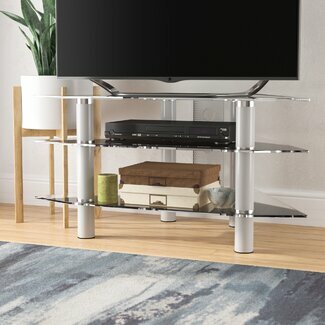 Further graced with hairpin legs in gunmetal gray finish, this TV stand is a sure shot heard-turner. It has two spacious shelves with cable management feature for holding your media players in a well-organized manner. Length: 19.49“ – Width: 41.97“ – Height: 24.61“ – Weight: 75 lbs. The Llanas Cedarwood 48 TV Stand smartly stores all your entertainment appliances at a single place. With a spacious top, an open shelf and five interior shelves, it offers ample space to accommodate all your media equipment. All five interior shelves are adjustable to suit your storage space requirement. It is compact and provides easy mobility. Crafted elegantly from manufactured wood, this TV stand is sturdy enough to hold up to maximum 200 pounds of weight. It is robust, durable and reliable. 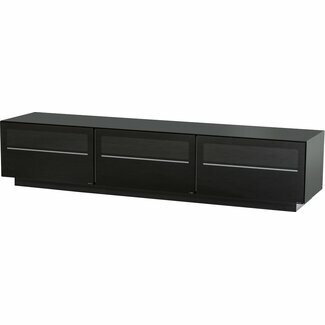 It features the black finish, bun feet and raised panel cabinet doors. Antique brass knobs on the cabinet doors create a charming look. Your family and friends will love this sophisticated TV stand. Functionality and elegance combine to lend this contemporary Abingdon 44 TV Stand a striking appearance. Crafted from MDF board and PVC laminate, this TV stand features sturdy and robust construction. Its textured black finish gives it a stunning look. With wide top and ample shelving, the Columbus TV Stand conveniently accommodates up to 52 inch TV along with all your A/V components. Length: 16“ – Width: 44“ – Height: 23“ – Weight: 64 lbs. Make your living room more elegant with the sophisticated style of Ricciardo 60 TV Stand. It features raised panel design, bracket feet and glass front cabinet door, and this TV stand flaunts a very classy look. 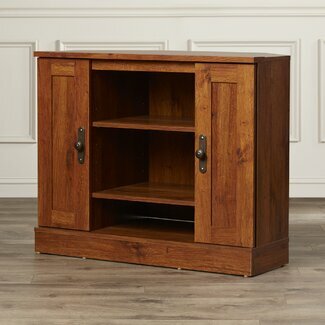 The tv stand has the classic cherry finish that lends enchanting charm to its overall look. This functional TV stand provides with ample space for holding all your entertainment equipment in a single place. The top of this TV stand is wide and spacious to accommodate up to 60-inch flat screen television conveniently. There are three cabinets with adjustable shelves for enclosed storage purpose. It is effortless and straightforward to assemble and low on maintenance. Length: 18“ – Width: 59.75“ – Height: 22“ – Weight: 5 lbs. The sophisticated profile of the Allingham TV Stand is praiseworthy. It is equipped with straight lines, raised panels, striking black finish and bun feet, and this TV stand showcases a stunning look. Thanks to the wide top and spacious cabinet, this functional TV stand has ample storage space for all your media components. It is sure to enhance the elegance of your living room while keeping your entertainment time full of fun and grace. Amplify the style quotient of your living room with the chic and stylish look of Pawlowski 47.25 TV Stand. It features a vivid white finish that looks very soothing and appealingly attractive. Its compartmentalized shelving design offers plentiful storage space to accommodate all your media components gracefully. Length: 15.75“ – Width: 47.25“ – Height: 23.75“ – Weight: 67 lbs. Treat your living room with the elegant style of these traditional TV stands. Gracefully designed and crafted from sturdy wood, these TV stands offer appealing looks with optimum durability. An array of drawers, cabinets and open shelves present ample space for all your media players. This TV stand collection provides a wide variety to select from a range of finishes and designs. Add style quotient to your home with the traditional Noelle TV Stand. The 75 inches wide TV stand has generous space to store all your audio/video devices efficiently. Featuring an open shelf, two big storage cabins along with a glass door cabin, this TV stand is an ideal choice for storing your DVD player, gaming consoles, cable boxes and other items at one place. This elegantly designed TV can be placed in your bedroom or living room. It is non-toxic and safe for your family and pets. The graceful Marblewood 60 TV Stand from the house of Breakwater Bay will prove to be a useful addition to your home. It is crafted out of high-quality materials, and this TV stand is robust and rigid to last for many years. It gives ample storage for all your media components. The open shelf has abundant space for keeping cable boxes or DVD player. One glass cabinet at the center comes with a rack for holding multiple items like gaming consoles, books or showpieces. There are two additional cabinets at the sides for media storage. It has efficient cable management holes at the back to avoid tangled wires. Length: 20“ – Width: 60“ – Height: 36“ – Weight: 134 lbs. Create a warm and entertaining space in your home with the Inglenook 58 TV Stand. 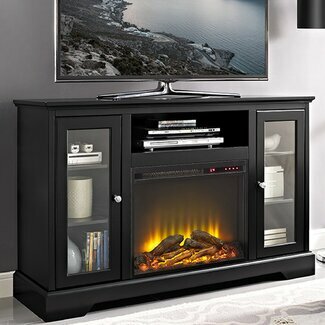 This TV stand has a functional electric fireplace insert featuring LED flame. This is a simple plug-in unit that is quite easy to install. It is made from high-grade MDF and laminate for lasting durability. With four open shelves, this TV stand provides plentiful space for keeping your all media equipment such as cable boxes, DVD player, Blu-ray player or other items. The Inglenook 58 TV Stand is a multi-purpose TV stand with the gorgeous design. Bring home this stunning TV stand for exceptional and enjoyable entertainment hours. Featuring attractive black finish and corner placement design, the striking look of the Harger Convertible 48 TV Stand will take your breath away. 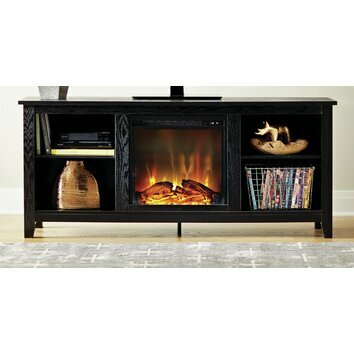 Great for nippy evenings and chilly nights, this TV stand comes with an electric fireplace insert. The flickering flame of the fireplace looks real and enchanting. The LED lights used to create flickering flames are energy-efficient and pose no burden on your electricity bill. It is an easy-to-use plug-in unit. You can place it in your bedroom or living room and enjoy your favorite TV shows or movies in a warm and relaxing environment. Flat Front: Length:1’ 3.75“ – Width: 4“ – Height: 2’ 8.25“ – Weight: 119 lbs. The Chantrell 42.6 TV Stand is sure to adorn your living room space with its elegant style. Its unique design and compact size make it ideal for any room size whether small or large. It is equipped with an open shelf and two cabinets with adjustable shelves. With an array of storage options, this TV stand allows you to organize and synchronize all your entertainment sets with feasibility. The cable management cut-outs at the back panel keep all cords and wires from cluttering and getting tangled. Manufactured from non-toxic and eco-friendly engineered wood, the Registry Row TV Stand is durable, rigid and safe for the kids. The beautifully designed Morris 60 TV Stand is a great entertainment piece. Its traditional styling with contemporary touch makes it compatible with any room décor. The robust wooden structure along with the smooth black finish gives it a flawless look. The raised panel cabinet doors, brushed nickel knobs and bun feet add the style quotient to its elegant profile. This TV stand in high on utility value with its wide open shelf and three cabinets. The center closet doors open to reveal a single shelf while side cabinets are equipped with two shelves each. With ample storage space for all your media components, the Morris 60 TV Stand is an ideal choice to watch TV with elegance and style. Give your existing living room décor an elegant touch with the Englewood Corner 37 TV Stand. Its traditional look is very appealing and charming. It sports sturdy wood construction with beautiful designing. This TV stand has plentiful storage space to accommodate your DVD player, Blu-ray player, cable box, gaming consoles and other items that include your collection of CDs and DVDs. 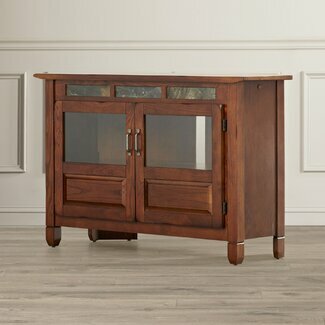 Bring home this TV stand and give your entertainment hours a traditional charm. 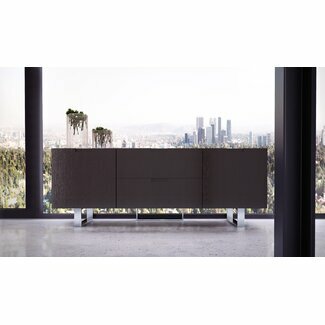 The Bilboa 54 TV Stand beautifully exemplifies the fusion of elegance, style and functionality. Its rustic and traditional style is attractive and charming. 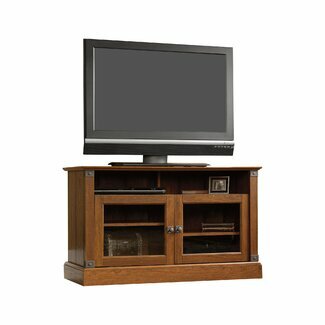 The poplar woods and oak veneers construction make this TV stand robust and durable. It features a sturdy and wide top that can easily hold 54 inch TV set. It has two roomy drawers that are perfect for keeping household keys, remote control and other items. Apart from the drawers, it also has two spacious shelves that provide abundant storage space to maintain and organize all your audio/visual devices. It is made from non-toxic and eco-friendly materials. This TV stand is safe for the environment and your family. Length: 18“ – Width:54“ – Height: 31.5“ – Weight: 130 lbs. The gorgeous Susanna Series 60 TV Stand sports graceful design with traditional styling to adorn your home. The smooth walnut brown finish glamorizes its overall look. 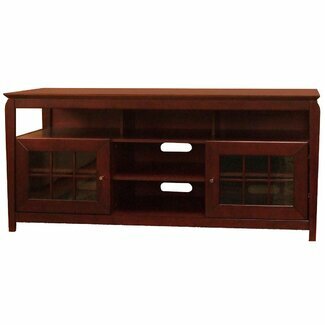 This TV stand is spacious and sturdy enough to accommodate a 60″ flat panel TV easily. It features compartmentalized open shelf at the top for the cable box, gaming console and DVD player. It has two spacious shelves at the center where you can keep your other media components, or you can also utilize this space as display shelves. Further equipped with two cabinets on the side, this TV stand offers plenty of space. The holes in the back panel for cable management to maintain all wires and cords tangle-free and organized while giving your room a neater appearance. The quality and construction of this TV stand speak for itself. It is an outstanding choice for those who seek quality and sturdiness without compromising on the looks. Length: 20“ – Width: 60.25“ – Height: 28.125“ – Weight: 96 lbs. 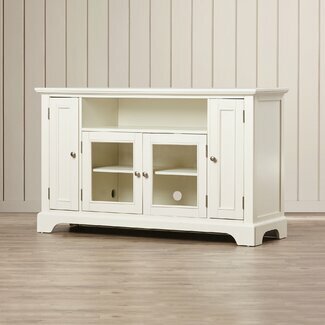 Bedeck your living room with the sophisticated and traditional style of Benson Corner 47 TV Stand. Showcasing clean lines, immaculate cuts and raised panel design, this TV Stand is indeed a delightful treat to the eyes. The TV stand is enriched with black rubbed finish for subtle distressing to intensify its stunning looks. A roomy cabinet with an adjustable shelf inside provides abundant space for all your media players, and other necessary items like CDs, DVDs and gaming consoles. There are eyelets in the back panel for clutter-free cable management that allows you to conveniently interconnect the media devices or plug into the socket in a neat and organized manner. With easy functionality, space-saving design and stylish looks, the Benson TV Stand is sure to appeal to you and your guests. Length: 20“ – Width: 75“ – Height: 25“ – Weight: 80 lbs. Give your home an elegant update while treating your entertainment media devices with care with these modern TV stands. 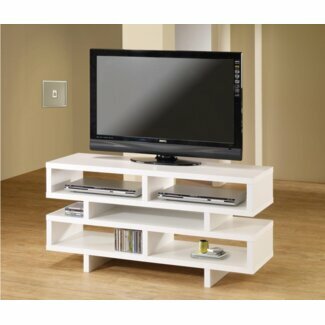 With plentiful storage space, these TV stands allow you to keep and organize all your media devices in a single place. Featuring elegant designs and attractive finishes, each TV stand in this collection is a stunning beauty. Add a twist to your home décor with the curvy design of Marini 60 TV Stand. Its stylish and sophisticated look will add to the beauty of your home. 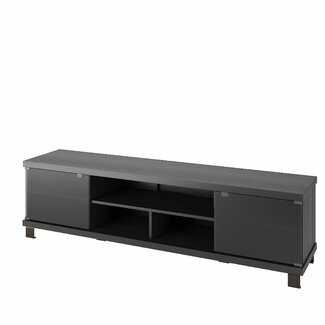 This modern TV stand has sturdy built and spacious top to accommodate up to the 60-inch television. With two drawers and four open shelves, this TV stand offers plentiful space for all your media components such as DVD players, stereo system, gaming consoles and accessories. The metal finished pulls accent the drawer fronts while providing a comfortable grip to open and close the drawers easily. The Marini TV Stand is functional and elegant and is sure to become a valuable addition to your home. Length: 18“ – Width: 60“ – Height: 22“ – Weight: 31 lbs. 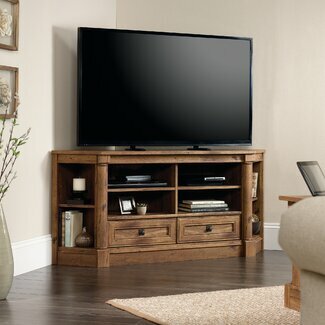 Give your living room a rustic touch with the lovely design and pale oak finish of Ivy Bronx Gamma TV Stand. It boasts a graceful look showcasing clean lines on the drawers. The drawers feature T-lock system with safety stop, so they don’t fall out on you when opened completely. The three drawers slide on metal glides for smooth functionality. With three open shelves and three drawers, this TV stand provides all the space you need for keeping your audiovisual devices and other accessories. Part of the Gamma TV Stand collection from the house of Ivy Bronx, this TV stand is sturdy and durable to last for many years. Place it against your bedroom or living room wall with some flower vase on sides of the TV, and you will be glad to see what a vast difference this TV stand creates to your existing décor. Length: 18.98“ – Width: 72.24“ – Height: 20.75“ – Weight: 174 lbs. 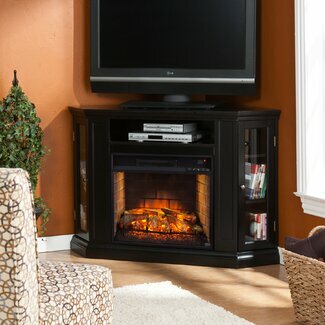 Enjoy the sight of the crackling campfire and its cozy warmth with this TV Stand that comes with an Electric Fireplace. The fireplace showcases a realistic burning log effect that reminds of a fun camping night. The flame and temperature are adjustable. The best part is that you can enjoy looking at the flickering flame even when the heater is turned off for all season enjoyment. This TV stand is multi-functional and high on utility value. The full top conveniently holds flat screen TVs for up to the maximum of 60 inches. 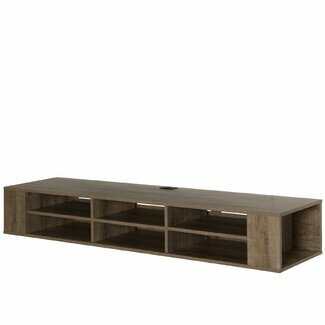 The total length open shelf at the top center is ideal for placing your cable boxes or DVD player. The adjustable shelves behind the window-pane doors are perfect for keeping your collection of CDs, DVDs and books. Bring home this stunning TV stand and enhance the elegance of your home with grace and its attractive look. The attractive Holland 71 Extra Wide TV Stand by dCOR design is an ideal choice for those who fancy sophisticated furniture. This TV stand has an extra-wide top that is spacious enough to accommodate a 71 inch TV easily. It has three open shelves in the center; one on top is perfect for the cable box, the two below that is ideal for the gaming console, DVD player or Blu ray player. The two cabinets on the sides offer additional space for keeping your other media components and CDs and DVDs collection. You can also put your books or decorative items. The shelves are adjustable. The cabinet doors are made from tempered glass and equipped with magnetic door catches. There are cable management holes in the back that helps in keeping your furniture and room clutter free. 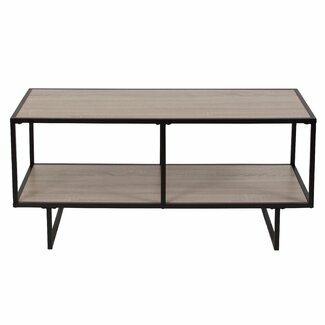 The Latitude Run have exquisitely combined the strength of wood and metal with the classy touch of glass into Watkin TV Stand. 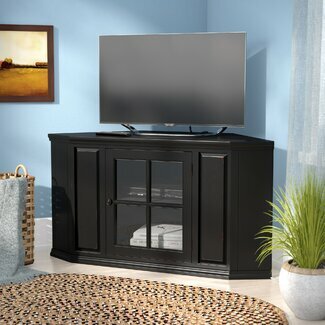 It features sturdy construction and large top to hold up to 45 inch TV set. The top shelf is a robust and durable tempered glass shelf that has smoke-gray color. The two open shelves below provide plentiful space for all your A/V devices. The open shelving design dissipates heat of the electronic device and keeps them from getting over-heated. Its stylish yet graceful look is attractive and appealing to give a charming touch to your home. Length: 15.7“ – Width: 45.2“ – Height: 17.7“ – Weight: 32 lbs. Gracefully designed to meet your home entertainment storage needs, the Belafonte TV Stand in an excellent choice for you. With two roomy drawers and two open shelves, this TV stand has a lot of space to offer. You can place your stereo system, DVD player or cable box in the open shelves and can also manage their cords with the holes in the back panel. The silver finished drawer bar, feet and circular bar accents on each side beautifully complement its black finish. Length: 20“ – Width: 60“ – Height: 22“ – Weight: 95 lbs. Crafted in Canada from manufactured wood, the West Lake TV Stand is sturdy, durable and robust to witness many seasons of happiness and enjoyable moments at your home. It features an electric fireplace that is ideal for providing supplemental heat and save your electricity bill. The natural looking burning log effect mesmerizes and reminds of childhood campfire stories. You can adjust the temperature and flame. You can enjoy the delightful sight of the flickering flame even when the heater is off. Along with the electric fireplace, this TV stand has a lot more to offer. It is spacious with multiple storage options. The three shelves at the top are perfect for keeping cables boxes, a DVD player and gaming console. The two cabinets at each side of the electric fireplace reveal adjustable shelves. You can store all your media components in the cabinets. The glass doors of closets allow remote control access that makes it easy for you to operate your audio video components. Length: 19“ – Width: 60“ – Height: 25“ – Weight: 145 lbs. Impress your guests with the cutting-edge and sophisticated look of Eldridge TV Stand. The clean lines and graceful design of this TV stand are very appealing to the eyes. The white lacquer finish gives it a classy touch. There are two drawers in the center while two flip down cabinets at each side that offer ample storage space for all your media components. Length: 18“ – Width: 61“ – Height: 22“ – Weight: 134 lbs. The graceful and unique look of Nika TV Stand is very appealing and attractive. It made of metal and tempered glass, and this TV stand is very sturdy and durable to last for many years. It features open shelving design, and the three shelves offer generous space for a 48 inch TV set and other media devices such as cable boxes, DVD player and your gaming consoles. This beautiful TV stand requires some assembly, and it is low on maintenance. Being ISTA 3A certified, this TV stand stays safe while in transit. Fusion of elegance and functionality, the Donovan TV Stand is an excellent choice for those, you prefer elegant furnishings. The open shelf in center with a cable management hole is perfect for your cable box or DVD player. Two drawers below the shelf can store other media components like gaming consoles, CDs and DVDs. Two media storage shelves on both ends offer additional space. It is sturdy enough to hold up to 250 pounds and a 52-inch flat panel TV set. It features textured black that enhances its overall graceful profile and complements all types of room themes. Enjoy the fresh air of countryside forest loaded with the fragrance of lavender and forest pine with this collection of rustic TV stands. 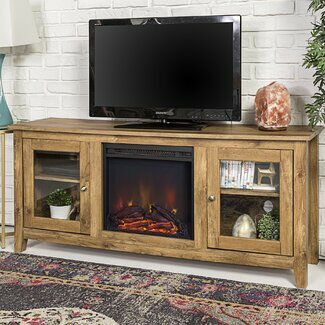 This collection of rustic TV stands features sturdy built with unique wood grain detailing and gorgeous finishes to select. These media consoles accommodate all your modern-day entertainment devices from plasma TV to satellite receivers, gaming systems, surround sound systems and other media components. Scroll through the selection of some of the best rustic TV stands and get the one that matches your room décor and color theme. Featuring louvered doors, bun feet and smooth salt oak finish; this classy TV stand is sure to become a valuable addition to your home. With ample storage space, it is an ideal solution to stow all your movie night essentials. Length: 21.58“ – Width: 62.68“ – Height: 25.43“ – Weight: 130 lbs. 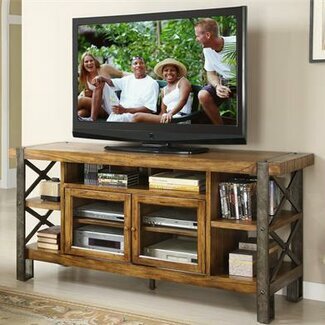 Impress your guests and garner loads of compliments with the charming and rustic look of Gallatin TV Stand. Its exquisite design combining wood and metal with skilled craftsmanship sets it apart from other TV stands. Featuring a mix of metal, engineered wood and Mindi veneers, this TV stand is robust enough to hold up to maximum 68 inch TV set conveniently. It has two open shelves at the top with cable management holes. There are four more open shelves where you can keep your books, photo frames or other showpieces to bring out the best in this TV stand. The two cabinets with glass door are perfect for dust-free storage of your media devices. Four metal legs serve as the sturdy base and provide support to the TV stand. This classy beauty is quite natural to assemble and is low on maintenance. Length: 20“ – Width: 68“ – Height: 32“ – Weight: 166 lbs. Simplicity, natural look and excellent craftsmanship are the hallmark of classic farmhouse furniture. 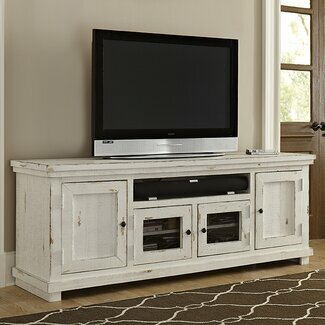 Featuring classic rustic look, the Franklin TV Stand is sure to add a dash of elegance and country style to your home. The wide top easily fits a 65 inch TV set. It features two open shelves in the middle and two spacious cabinets on each side. The shelves are perfect for keeping satellite boxes or cable boxes. The cabinets house your electronic devices and keep then dust and grime free. Bring home this handcrafted beauty and give your home décor a classic country touch. Length: 18“ – Width: 59“ – Height: 23“ – Weight: 125 lbs. Accentuated with running slate tile detailing, glass doors and raised wood panels, the Sandy Granite Range TV Stand is a classy beauty that impresses anyone who laid their eyes upon it. The distressed rustic oak finish adds to its charming look. The top is wide enough to hold a 50-inch flat screen TV. The two cabinet doors open to reveal plentiful storage space where you can keep your DVD player, cable box and gaming consoles along with their accessories. 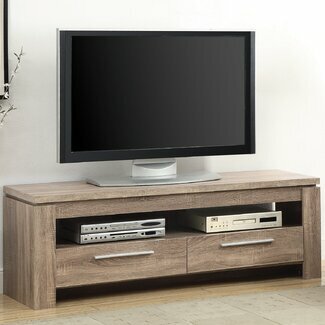 Elegant and functional, the Sandy TV Stand is a must-have for those who do not compromise on looks and functionality. 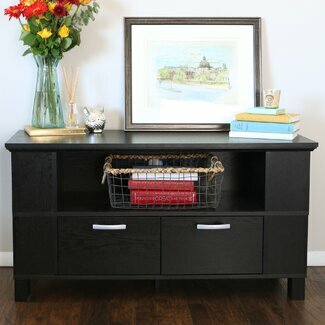 Add oodles of charismatic charm to your home with the Hickham 50 TV Stand from the house of Birch Lane. 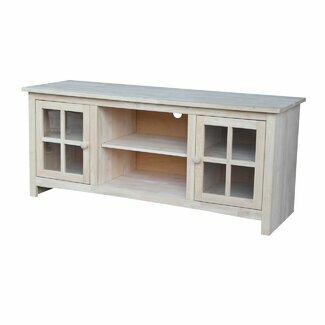 Beautifully crafted from Acacia and MDF wood, this TV stand is robust and sturdy to last many years. It features ample storage space with two open compartments and spacious drawers. 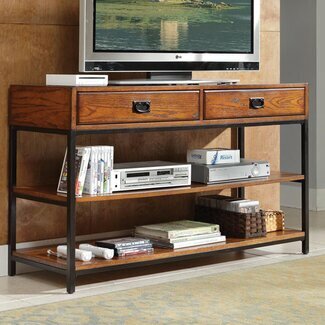 The textured brown finish of the Hickham TV Stand is very charismatic and praiseworthy. Bring home this gorgeous TV stand and get ready to garner the compliments of your guests on how exotic this TV stand looks! Length: 19“ – Width: 42“ – Height: 28“ – Weight: 78.1 lbs. Bring home this designer wall-mount media unit and give your place a stylish touch. 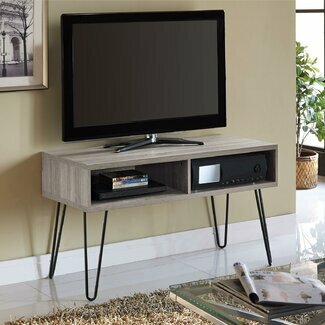 The City Life TV Stand is designed to lend your living room space a superb airy feel. Place your TV on top of it and enjoy the best views no matter where you are sitting in your room. It is easy to put together and mount on wall. It comes with the metal hanging support that is required to fit this TV stand on the wall. Just make sure that it is securely attached to the stud. It features six open shelves at the front and two lateral shelves. Now you can efficiently keep and organize all your media devices into this media console and impress your friends and guests with your smart choice! 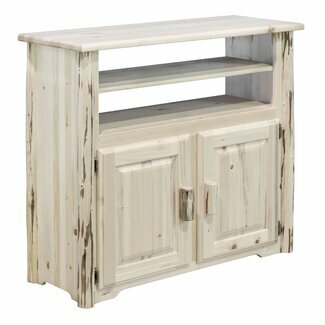 Featuring classic distressed look and rustic style, the Abordale TV Stand is a piece of art in itself. It is handcrafted in the USA from solid wood so you can be assured of its most exceptional quality and robust built. The top of this TV stand is wide and sturdy enough to conveniently fit a widescreen TV of up to 52 inches and no more than 100 pounds. It is a perfect storage solution for keeping your satellite receiver, gaming systems or surround sound system. Looking for an elegant TV stand to place your TV in the corner? The Orviston Corner TV Stand is an excellent choice for you that promises graceful design, durability and sturdiness. Manufactured from quality materials to last long, this Corner TV Stand is sure to witness wear and tear of time and seasons at your home. 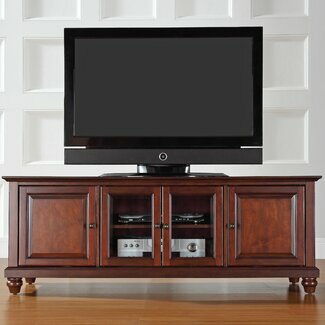 Featuring two spacious cabinets; this TV stand offers ample space for all your audio video devices and gaming consoles. The natural slate tiles above the cabinets embellish the TV stand, lending it a classy touch. The distressed pewter finished ring pulls add a bit of classic art while aiding in the smooth operation of opening and closing the cabinet doors. Ideal for corner placement in either your bedroom or living room, the Corner TV Stand from the house of Three Posts is sure to become your favorite furniture. Length: 25“ – Width: 47“ – Height: 33“ – Weight: 85 lbs. 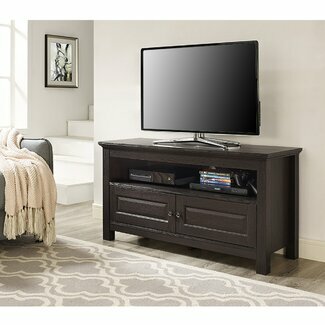 The Pineland TV Stand creates an inviting entertainment corner in your home. It allows you to sit back, get comfortable and enjoy watching your favorite movies. With ample space available to keep your satellite receiver, DVD player and other media devices, this media unit is an ideal choice for rooms with compact space. For lasting durability and sturdiness, it is crafted from cottonwood, alder and pine wood. The appealing natural pine finish works well with all room decors and color themes. Its casually elegant appearance is beautiful to the eyes and paints a picture of a quiet mountain country getaway in your mind to grant you a much-needed escape from daily routine. Add an elegant charm to your home décor with the graceful profile andlovely brown finish of Loanne TV Stand. Its natural worn out finish reflects a slight hint of antiquity. This graceful TV stand features a spacious top to hold up to 50 inch TV and two wide open shelves for all media devices. Its open shelving design aids in ventilation and speeds up cooling down of electronic devices. Length: 18“ – Width: 50“ – Height: 30“ – Weight: 122 lbs. 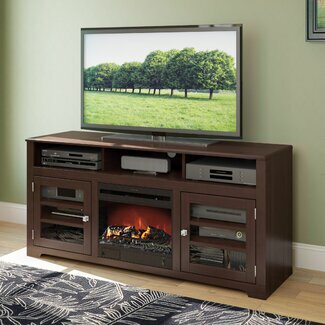 TV stands with electric fireplace are popular these days. Generally, fireplace TV stand is mostly considered electric; though, there are still some non-electric types. The purpose of this TV stand to add beauty to the TV room. The heat is usually optional which mean, you can turn it on or off, but the fire mimics the real fire without the need for gas or wood. The room remains free from gas and gives you a pleasant experience while you enjoy your TV shows or movies. It is another form of fireplace source in a TV stand. Propane is an essential part of LPG which is better than Butane in many ways. Propane is being stored in a tank cold down to -45 degrees gives greater pressure as compared to butane, giving you the similar fireplace experience. The only difference here is, it is not electric but the propane gas TV stand. It is a prevalent form of gas which doesn’t need any tank to keep it stored. Not only that, it burns clean for a fireplace too. Generally, it saves you costs versus using alternatives. Another benefit is that you do not need so much wood with this kind of gas. It keeps your room hot on colder days while you focus on watching your favorite movies. 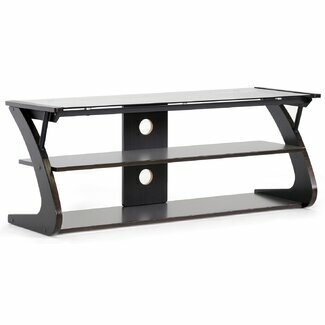 As its name suggests, this TV stand attaches or is placed on your desk. It isn’t merely like the regular TV stand which comes for free with the LCD or led TV. It is the little bit bigger and is durable. But it depends on your TV manufacturer, and the chances are they can also give you a free TV stand with TV which may look more suitable for you. It is usually a tall metal TV stand with dual sides allowing you to attach a TV on both sides. So, in this case, one TV stand adds two televisions. It means no more fight with your spouse for your favorite channel or movies. Now you might be wondering what about sound? Wouldn’t the music of two televisions mix? Well, either of you can use a wireless headset if it is compatible with your TV. So, both can watch their favorite movies without distraction, in one room. This form of TV stand keeps your TV watching experience clean because the TV wires look invisible and TV is mounted on the stand or wall similar to a picture or frame. OK, so how it is done? The TV wires are organized beautifully within the TV stand, so its cables do not show up around your TV because these are hidden in the organizer behind your TV. Keeping your TV room clean and wire-free. It is another unique form of a TV stand. It connects to your bed’s footboard. So, what problem does it solve? It gives you a close to TV experience when you are laying on your bed. It can attach TV with a metal TV stand connected to the footboard, or it can be a pop-up slot on your bed’s footboard so the TV can only come out whenever you want. As it is something unique and most bed footboards do not have this feature. So there are many standalone lift-up TV cabinets which can be placed by the footboard to perform the same function. This type of TV stand as the name suggests, it is built especially for gamers. Some features are Cabinets for consoles, their DVDs, controllers and accessories etc. Not all gaming TV stands are the same. The styles and features vary. It depends on the taste of gamers how do they like it to be. I am a pc gamer myself, and I can understand the importance of a gaming TV stand. Some of the best gaming TV stands are Atlantic Black Centipede Game Storage and Axon 3-in-1 Gaming Theater TV Stand, and the structure of these TV stands is mainly designed for gaming. If you are looking for a TV stand with some compartments or shelves to store DVDs or other TV related items, a TV stand with hutch would be suitable for you. There was a time when televisions were usually smaller so that even a simple table was enough. These days there are LCDs, LEDs, Plasma TVs and even 3D technology TVs with the massive size of up to 60 to 100 inches or even more. These TV stands may require the large size of hutch TV stands. 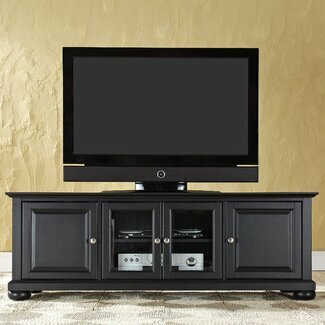 Some of the Modern hutch TV stands work similarly to floating TV stands by keeping wires organized behind. This TV stand comes in two forms in which either it’s top is oval or its front. The oval top TV stand look ideal because it has the necessary area on its middle top and then it has narrow sides making an oval shape. Usually, these TV stands look like a small table or dresser with a few cabinets. The other form of this TV stand is oval front which resembles a piece of stylish furniture, and it is extra wide, having an empty oval area to place related items such as DVD players or gaming consoles. Both are good depending on the features. It is generally the most popular type of TV stand which is not called by the word “rectangle” because when a standard table or TV stand comes to mind, people already believe it should be the rectangle. There are enormous styles in this kind of TV stand shape. It is not only about a TV stand, but take a look at almost anything in your room, even your new LCD/LED TV, it would be rectangular. We are so much used to it by now. The round TV stand can’t look like a complete round in shape except for round top TV stands. It can only be in the case when it is a TV stand with hutch which forms a circular shape around your TV. I haven’t seen most of these, but there is still some good variety of these tables for different living room styles. This kind of TV stand would be suitable for small rooms because if you do not have enough space to place a rectangle one, the square TV stand will do the thing. Here square doesn’t mean the square top stand as in this case it may look too small or if it is significant, it may take so much area in the room (as it is should look like a TV stand, not a dining table). But usually, its forward shape looks square. A triangle TV stand generally used as a corner TV stand is good if you like to place your TV in the corner of your room. The reason can be the room is filled with other furniture pieces, or you only want to style your room differently. But if you think about it, a triangle TV stand on the corner looks great. People usually use room corners for decoration purposes but adding a TV would be something different; however, it might be uncomfortable for some people if the sofas are not towards that position. With proper room decoration and seating space, you can have maximum fun with a suitable TV stand. If you have a small room with a large TV stand, instead of regular sofas you can consider using a daybed which lifts you up due to its large size and it can accommodate 3 or more people easily. Not only that, if it looks relevant to your room, you can also add some benches for extra seating space for some guests or kids. Now, this is creative. Like drawing or painting, easels can hold an excellent vertical size of the drawing board. Similarly, these can fix a wide TV by easel’s clips. However, you should make sure the easel is durable to hold your TV, and its legs must carry the weight of TV. With an easel, it can be placed in almost any place such as easily in the corners of your room. If you have some creative skills, you can add a wooden board below easel to put DVDs and other accessories. Because of the size and shape of a regular console table, it can for sure look like a TV stand for your LCD or Plasma TV. Not only that, but it can look more attractive as its shape would match with a slim TV. Console tables are usually thin so make sure you have such kind of console table for this. An old piano can also be used as a TV stand other than its fabulous music. It doesn’t mean that you only have to place a TV on a keyboard but you can re-purpose a piano into a TV stand so it remains a piano and at the same time can work as a TV stand. The catch here is, your guests shouldn’t only focus on the modern furniture in your room, but a piano which might be left for your from your ancestors can become the point of focus for your friends and guests while they watch TV. OK, that might sound strange but using a bookshelf as your TV stand can be beneficial. If your spouse is a reader, place some of their favorite books. If they do not like a channel or program you watch, they may pick a book and start reading somewhere without distracting you. A black or any dark color book stand will give a matching experience with TV. It is the most common type of outdoor TV stands because you can move it quickly. It is usually lightweight for even a teenager to move. In most cases, you would find metal stands, as wooden would be heavier. Some of these TV stands feature a small laptop stand below the TV, so whenever you have to do some important work you can do it comfortably outside. This kind of TV stand is a unique invention. It is a hidden TV stand which keeps TV inside, and when it is time to watch, the TV pops out. However, it is an outdoor TV stand which means to have an extra TV for this. But it is still a good TV stand if your evening usually spends in your garden. The good thing is, you can also make your outdoor TV stand by using some wooden boards. Now if you have never made something like that before it is also ok, here are some tips on how to do that. Ameriwood helps you furnish your home on a budget without compromising style of your choice. Having a mission to improve their customers’ lives keeping things affordable for them. They keep improving their products. Ameriwood considers their customers “a home” and they need them to look up to them for their home furnishings. 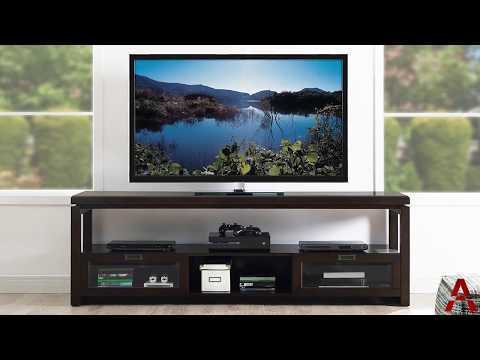 This video shows how Ameriwood Home Harbor TV stand can be assembled in 4 easy steps. Baxton Studio has been offering their online furniture services for last 16 years as it started in 2002. They have great experience in sofa manufacturing. Their mission is to make it easy for their customers to order furniture online having security and comfort. Every month they deliver more than 200k furniture pieces nationally. On wayfair, Baxton Studio items seem like merged with Whole-sale Interiors. Baxton Studio assembly instructions for tv stands and other furniture are available here. It has been 30 years since this company started with its main focus to become a modern furniture marketplace leader. They are committed to continuously making their customers their top priority. They also like to help people finding the replacement parts and assembly instructions. It was established by Erie Sauder in 1934 as a woodworking business in the barn which was behind his home in Ohio. Sauder has been a leading RTA (ready to assemble) producer in North America. They have made it easy for an average person to assemble their furniture without having much technical skills. 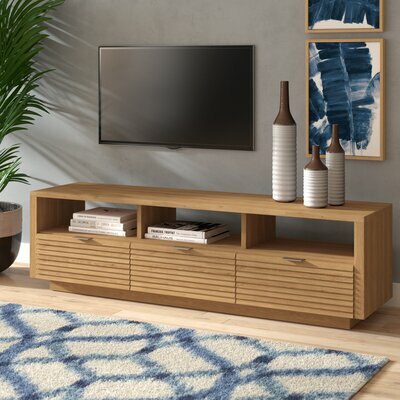 However, if you still need assembly instructions for specific TV stand you can request an instructions book from Sauder here. So, we discussed about features, materials and brands of best TV stands. 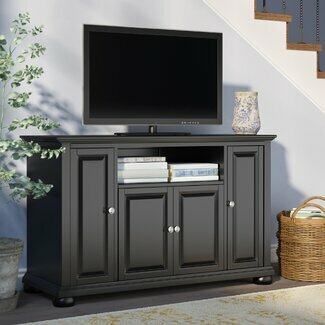 The purpose of this article was to describe as much possible aspects of a TV stand to help you as much I can.